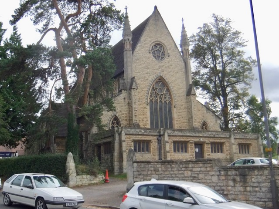 Saturday 17th February GOA recital at 2.15pm for AGM at 3.15pm at Holy Apostles’ Church, Cheltenham. 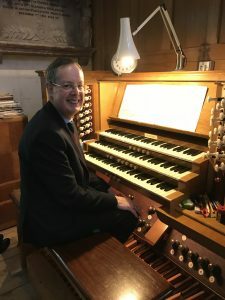 The meeting started with an organ recital by our member Dr. James Lancelot D.Mus, FRCO, the retired organist of Durham Cathedral. The AGM followed at 3.15pm. 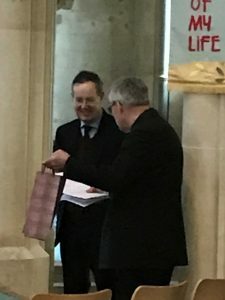 After James’ recital, Ian Fox thanked James and presented him with a bottle of claret on behalf of the Association. 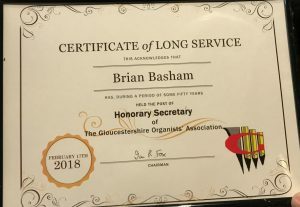 The AGM marked the retirement of Brian Basham after over 50 years of Secretarial work with the GOA. 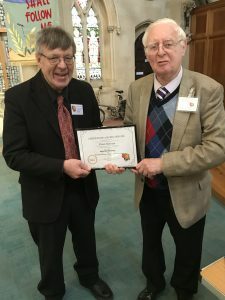 He is pictured here receiving a framed Certificate to marks this. Brian also received a badge denoting his new role as Secretary Emeritus. In this he will be responsible for the production of the Association Newsletters. 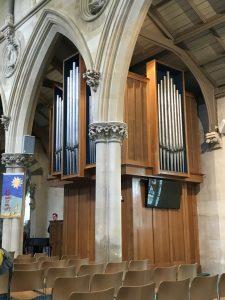 Three new Committee members were voted in and a complete list of the Committee appears elsewhere on this website. . .